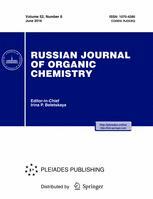 The Russian Journal of Organic Chemistry (Zhurnal Organicheskoi Khimii) was founded in 1965. It covers all aspects of modern organic chemistry including organic synthesis, theoretical organic chemistry, structure and mechanism, and the application of organometallic compounds in organic synthesis. The journal is of interest to researchers in both scientific and industrial institutes, as well as for university libraries. AGRICOLA, Academic OneFile, Academic Search, Catalysts and Catalysed Reactions, ChemWeb, Chemical Abstracts Service (CAS), Chemical and Earth Sciences, Current Abstracts, Current Chemical Reactions, Current Contents/Physical, EBSCO, Gale, Google Scholar, Index Chemicus, Journal Citation Reports/Science Edition, OCLC, Reaction Citation Index, ReadCube, Reaxys, SCImago, SCOPUS, Science Citation Index, Science Citation Index Expanded (SciSearch), Summon by ProQuest.